The ability to recognize birds by their voices is not only great fun but also perhaps the most useful field skill that a birder can master. 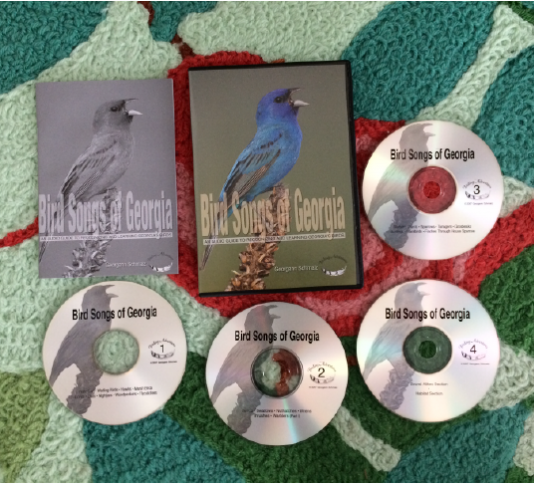 Birds Songs of Georgia presents the songs of 143 of the most common Georgia birds that are found from the mountains of the north to the barrier islands of the coast. The instructional narration for each species` voice examines its physiographic location in Georgia, its habitat and voice mnemonics. The fourth CD contains 18 habitat tracks that make a great learning aid for helping the listener hear and recognize each song. Even experienced birders will enjoy identifying all the birds singing in their associated habitat. Introduction that describes the characteristics of bird voices to help you learn and remember them. Each species has a track that describes the habitat, location and song characteristics. Each song is on a separate track for quizzing yourself. Helpful mnemonics and phonetics of songs and calls are given. `Sound alike` songs are recorded together to better compare and learn them. A unique section of `habitat` tracks from 18 different locations across the state of Georgia.The birds in these habitats are identified on subsequent tracks so you can listen for and identify each bird. Forty two page booklet describes songs, habitats and locations for each bird. At first, I counted more than nine birds in the group (sometimes 10 and sometimes 11) because I was mixing up the start and stop points of different birds. By the time I had spent about 30 minutes listening to the track over and over, I could get nine species and distinguish repeats, but that came after I had listened to most of the birds separately on CDs 1-3. So even this relatively easy exercise was a challenge. I got the Downy, Turkey, Cuckoo, and Gnatcatcher right away as very distinct, but I mixed up and over-counted warblers. As for your second exercise of following the birds along in order of their songs. This process was also challenging. At first, I did not hear the Acadian Flycatcher at all. I could tell I was missing this bird, so I went to its single song track, which helped lots. But even after I familiarized myself with the fycatcher, I had to listen several times to really hear this one; he blended in with the warblers and waterthrush. I suppose that after I listened to the track about 15 times, I could follow the order with confidence that I was hearing each bird distinctly. I liked doing this; the process was like putting a puzzle together. And I think that if I repeat this process, I can really learn the songs.